Nantucket, located approximately 30 miles south of the coast of Cape Cod, has two exceptionally well preserved village centers (Nantucket Town and Siasconset) which retain nationally important examples of architecture from the Colonial, Federal, Greek Revival and Victorian periods. In addition the island has a large concentration of buildings from the early 20th century when architectural preservation and architectural revivals based upon Nantucket’s past dominated new construction. The survival of Nantucket’s historic buildings is due in large part to the economic decline of the whaling industry in the mid 1800s. The island was largely forgotten for half a century and, as a result, its fine architecture survived through neglect. By the late 19th century, efforts to preserve the island’s historic resources were initiated—echoing the nation’s early preservation movement. The first preservation work on island included the saving of the Old Mill in 1894, and the adoption of voluntary steps by contractors and property owners to ward off insensitive changes to historic buildings. These actions created an atmosphere where new construction reflected the island’s appreciation of its historic architecture. In 1955, Nantucket was one of the first communities in the nation to establish a local historic district. Originally encompassing only the Old Town and the Village of Siasconset, the local historic district regulates exterior changes. The district was expanded in 1971 to include the entire island as well as the islands of Muskeget and Tuckernuck. 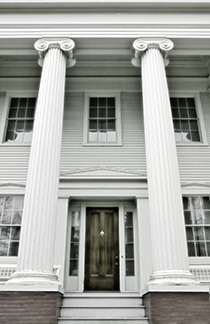 In 1966, the Nantucket’s historic district was designated one of the country’s first National Historic Landmarks (NHL). In 1975 the NHL also was expanded to cover all of Nantucket Island as well as the two outer islands. Today, most islanders and visitors think of Nantucket and historic preservation simultaneously—but the reality is that the historic fabric is being destroyed every day. Nantucket’s very success as a summer resort poses a threat to its historic resources. The Nantucket Preservation Trust, as stewards and advocates of the island’s rich architectural heritage, aims to further preservation education and protection of our historic resources. Our work includes partnering with other preservation-minded groups and reaching out to residents, owners of historic properties and visitors. It is our hope that more and more property owners will think of their historic properties as valued art objects—one-of-a-kind treasures that through a mix of luck and love have survived intact to this day. To truly save Nantucket’s historic resources, we all need to value and appreciate not only the exteriors of historic buildings, but the quirks and flaws of their interiors that make them different and give them character. And we all need to encourage patching, repairing and recycling instead of, gutting, replacing and wasting valuable historic materials.